Cleaning is one of the last things one wants to do. Even a non-lazy person becomes lazy when it comes to cleaning. How cool it would be if there be a something like a robot that cleans the home and picks up after us, right? Although, I think such a robot is not far off. Either way, for now, we have to stick to good old-fashioned cleaning. But, these cleaning tips will make cleaning easy and you will never clean your house the same way after seeing them. Here are 31 of all time best and fast cleaning tips that will help you to make your house sparkling in no time! Old newspapers along with soapy water is a perfect combination for cleaning the windows. Just wash the window with soapy water and then buff with scrunched-up newspaper. This is one of the easiest methods to clean windows. You can also use paper coffee filters if you have the fear that the ink from newspapers will catch on your finger. Do you still dry clean the carpets? Well, no need for it anymore. 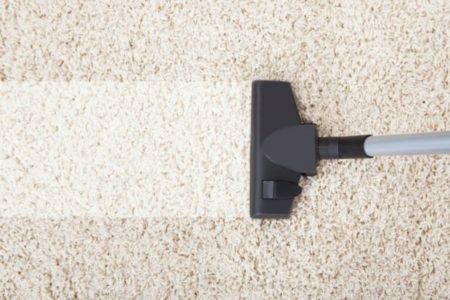 All you need is two cheap and easily available kitchen cleaners called vinegar and baking soda to easily clean the carpet. Just sprinkle baking soda on the carpet and then sprinkle vinegar over it. Let it sit for at least an hour before vacuuming. You have a clean carpet without spending a single cent on dry-cleaning and it does not take much time either. WD-40 is an indispensable tool to remove almost any stains whether it is from your clothes, curtains or even carpets. It doesn’t even spare grease and lipstick stains. 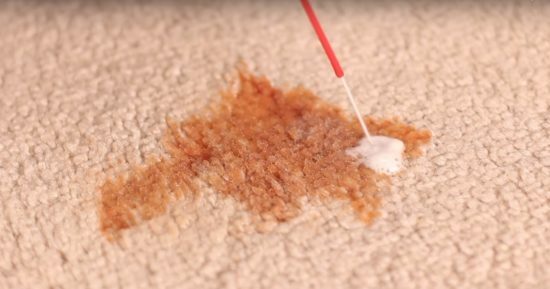 So, don’t let that ketchup ruin your favorite carpet, just spray some WD 40 over the stain and soak it for 5 mins. Now, wipe it with a clean cloth. Gone! 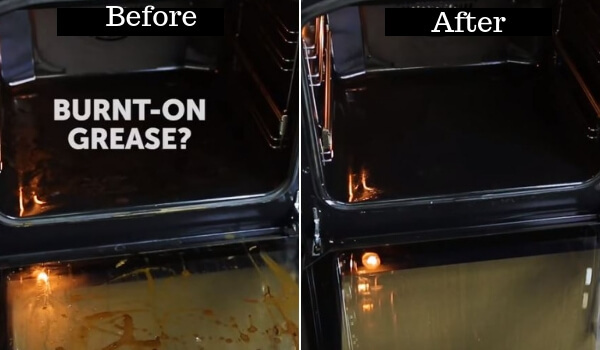 WD-40 can also remove blood stains if you catch them early enough. Keeping a can of WD-40 in the home is pretty useful as WD 40 has some amazing uses around the home. Did your toddler leave his creativity on the wall? Don’t worry clean it with a magic eraser easily. Just grab a magic eraser and wipe it over the wall to have a clean wall again. Alternately, you can also use borax to clean the stain. Just mix 1 Tbsp borax with a cup of warm water and apply it on the affected area and wipe it with a microfiber cloth. Tada! It will easily remove pencil and crayon marks from the wall. Quick Note: Before using it on the stain, make sure that the paint doesn’t come off by testing it on some region of the wall. Need cleaner and stain-free clothes? Just add 4-5 Tbsp of Borax to your laundry and you have a cleaner, stain-free and better-smelling clothes than ever. Borax gives a natural scent to the clothes and can even be used to wash the delicate fabrics. It works great to remove hard water stains from your clothes and washing machines as well. Borax is a great disinfectant too and inhibits many organisms, including fungi, mold, and bacteria. 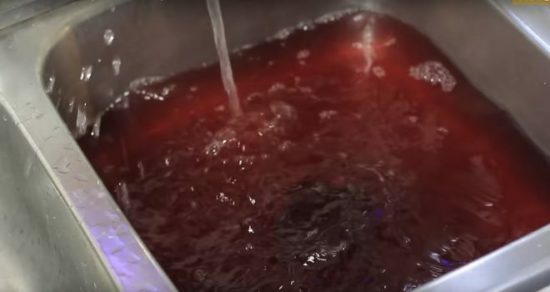 Removing hard water rust stains is easy using borax. Just take some borax in a damp cloth and scrub it on those hard water rust stains. Rinse them with clean water. Easy! 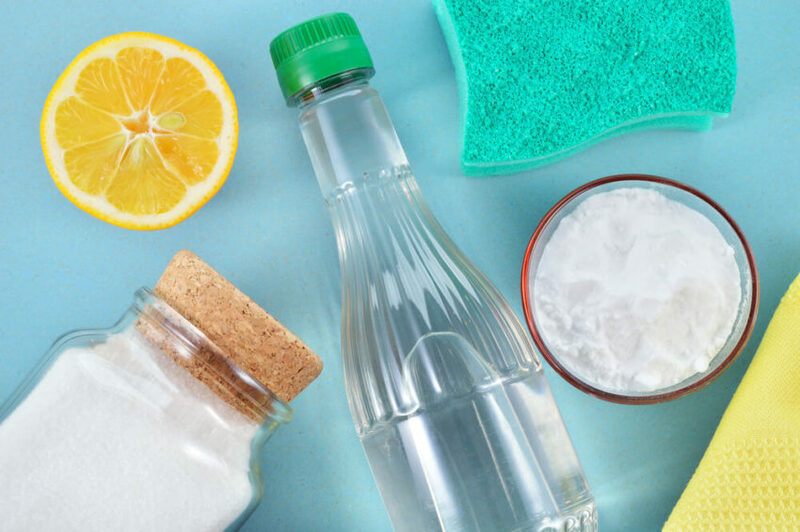 Borax is an amazing cleaner with so many uses around the house. Easily clean tarnished silver at home just by using vinegar. Make a solution of 1 Tbsp vinegar, 1 Tbsp water and 2-3 drops of dish soap and let your jewelry sit in this mixture for around 15-30 minutes. Now use a soft bristle brush to gently scrub off any dirt or grime and rinse the jewelry. Finally, wipe it off using a microfiber cloth. You can even use it to clean your expensive diamond rings (it won’t damage them). Cover the entire greasy area with a thick paste of baking soda and water. Then, spray vinegar all over it. Let it sit for 10 mins. Wipe it off with a sponge. It will get easily cleaned in no time! White vinegar does an amazingly good cleaning job to easily clean the tiles. Just moisten a cloth in vinegar and rub vigorously on the tiles. Or you can even use a sprayer to spray vinegar on the tiles and then clean the tiles with the help of a sponge. Vinegar removes most dirt without scrubbing and doesn’t leave a film. One of the most common problems of the shower and the glass around the showers is scum deposited over it. But you can easily get rid of scum using vinegar just like it cleans tiles. Unlike tiles, rub the surface of glass shower doors gently. Rinse with clean water and then wipe with a clean dry cloth. 12. After Cleaning Your Glass Shower Doors, Use Rain-X To Repel Future Water Scum, Stain, And Streaks. Cleaned the shower scum, now prevent it to appear in future by using Rain-X. Rain-X is not only for car windows! You can even use it on your glass shower doors to help repel future water scum, stains, and streaks. After all, glass is glass whether it’s car glass or shower glass. The oven glass is one of the hardest things to clean in the kitchen, so most of us turn towards chemicals to clean it or simply ignore it. But, no more! All you need is Mr. Clean magic eraser to easily clean the oven glass without using any harsh chemical. Magic Eraser is an amazing cleaner. Alternate between a wet and dry eraser and with a little bit of elbow grease your oven will be sparkling clean! An easy and no scrubbing way to clean your microwave! Just use vinegar and water solution in a microwave safe bowl to steam clean your microwave or buy an Angry Mama to steam away hardened food and other microwave junk in seconds. These two are the easiest and best method to clean the microwave. 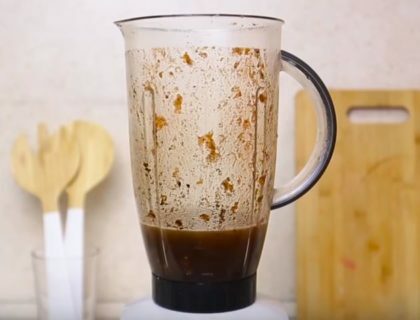 Clean your blender in flat 30 seconds without scrubbing. Just pour 3 cups of warm water followed by a few drops of liquid soap in the jar and whizz for 10-15 seconds. You’ll never ever have to perilously stick your hand into that jug again! Electric kettle accumulates mineral deposits overtime especially form hard water. So, it becomes imperative to clean and maintain them. 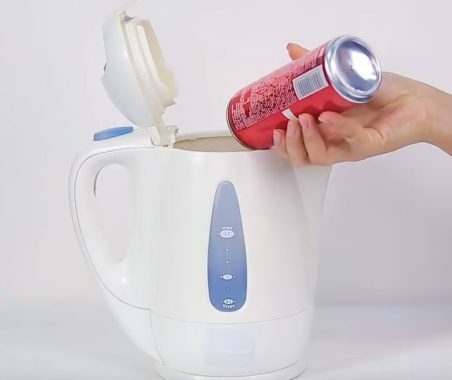 And nothing can be easier than this to clean an electric kettle, just empty a can of cola and bring it to boil. After 5 minutes, empty the contents of the kettle and you have a shining clean kettle again. Unusual shaped bottles can be tricky to clean, but using rice it’s an easy game. All you need to do is to pour a handful of rice in the bottle followed by a bowl of warm water and a teaspoon of detergent. Screw the lid back on and give it a vigorous shake. Rinse out to reveal a sparkling clean bottle. It’s a little unusual cleaning hack, but hey it works! Dump half a cup baking soda in the drain and then pour a cup of vinegar over it. 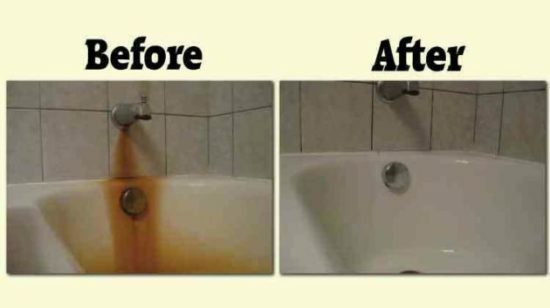 The reaction of baking soda with vinegar works like a charm to unclog the drain. Once it stops foaming, wash it with water and you unclogged your drain easily in 2 minutes. Sounds weird? But it works. Copper pans are a beautiful way to modernize your kitchen. But, if they get dirty after use, how do you clean them? Well, there’s a cheap solution hiding in your cupboard – Humble tomato sauce. Tomato sauce is actually great for cleaning and it will make copper pans shine just after a quick rub. Having a tough time cleaning that greasy and dirty stove filter? The best and easiest way to clean a greasy stove/oven filter is to use baking soda to clean it. First, boil 8-10 cups of water in a pan and add a cup of baking soda in it. Now, put the dirty filter in this mixture and continue boiling for 5-10 minutes. The action of baking soda and heat will remove the grease from the filter in no time leaving it sparkling clean. Cleaning Washing Machine, seriously? Who cleans a washing machine? My first words when I stumbled upon this cleaning tip from Jillee. But, it does make sense to clean a washing machine as it cycles through a lot of dirt and grime which can start to build up inside it making it less efficient and less effective. First, run one full cycle using only bleach to clean and sanitize. Then run a second cycle with vinegar to help dissolve soap scum and grime. Next, use scrubbing pads to clean around the washer’s drum. And it’s done! Your washing machine is deep-cleaned. So easy! The king of dirtiness, which we prefer ranking last even in cleaning the bathroom which itself is hated. But cleaning it is important but not hard. All you need to clean the toilet is baking soda and hydrogen peroxide. Just sprinkle baking soda all over the toilet and then pour some hydrogen peroxide over it. Leave the pot in this state for 10-15 minutes so the mixture of Vinegar and baking soda can clean it. Then scrub with your toilet brush. 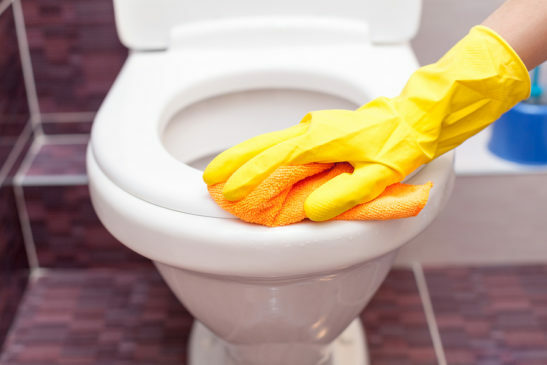 Flush and you will observe that all the germs, scum and dirt has vanished away leaving the toilet sparkling clean. Most commercial bathroom cleaners contain bleach and other harsh chemicals which are hazardous for health. But, there is an alternative for these cleaners in the form of hydrogen peroxide. Plus, it costs a few dollars and is cheaper than most chemical cleaners. This is a must try if you want to get rid of toxic chemicals. When used with baking soda, it can also remove the grout from tiles easily. All you need to do is to sprinkle some baking soda on the grout and then spray some hydrogen peroxide on it. 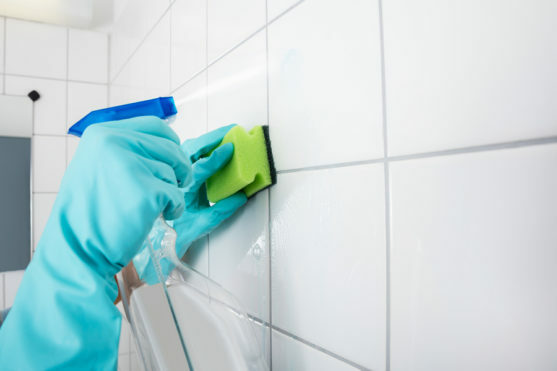 Let it sit for a minute or two for cleaning action of hydrogen peroxide to work and use a brush to scrub the grout out of tiles easily. 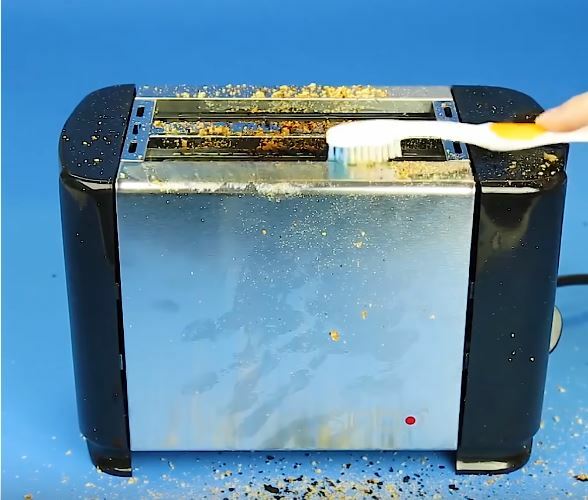 Easily clean out your toaster by using a toothbrush. Unplug it and turn it upside down and give it a gentle shake to remove crumbs. Use a clean toothbrush to remove crumbs from hard to reach places. Give it a nice shine with a little bit of white vinegar and a dry microfiber cloth. 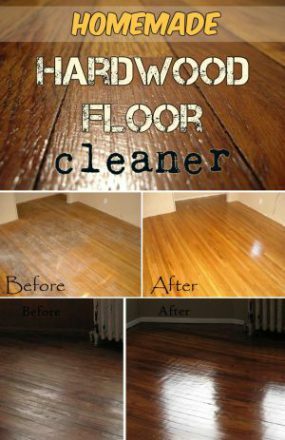 Shine your hardwood floors with this homemade hardwood floor cleaner. Just mix 1/2 cup vinegar, 1 tablespoon castile soap, 1/4 cup rubbing alcohol, 2 cups warm water, essential oil (optional) and your eco-friendly floor cleaner is ready. My Cleaning Solutions has step-by-step instructions on how to go about it. Get rid of all the grime and mold from the exterior of your fridge using baby wipes. If a particular area is too grubby, wipe it twice. Baby Wipes are an easy way to get a shiny clean fridge. Not only the fridge, but baby wipes are also incredibly useful for cleaning most kitchen appliances exterior too, like your microwave, kettle, toaster and coffee machine. With just 3 ingredients, you can easily make your glass stovetop look like new again. The three needed things are baking soda, hydrogen peroxide, and Dawn dish soap. First, sprinkle dawn soap, then baking soda and in the end hydrogen peroxide over the stovetop. Scrub it using a brush or using fingers(we use gloves) so that the mixture is mixed and spread evenly. Let it sit for 3 minutes and then wipe clean with a microfiber cloth. Magic! Your stovetop will be clean like never before. 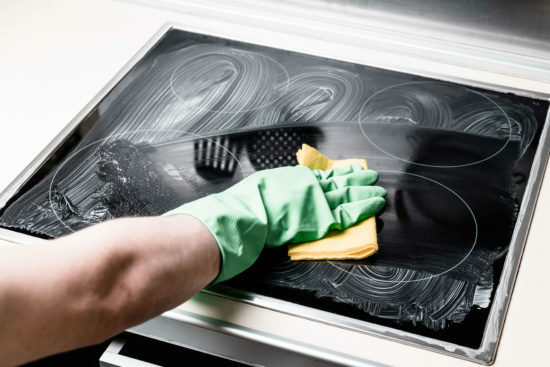 Just by using a little bit of car wax on your stovetop will help in easy cleaning future spills and messes. Any future spills — no matter how crusty — will wipe off in a jiffy. On top of that, your stovetop will always look shiny and new! 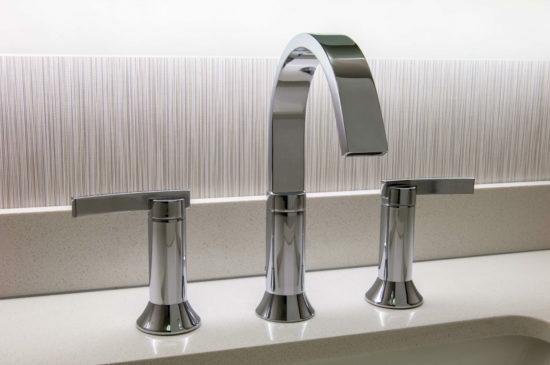 Want to make your chrome faucets shine like they are brand new? Use dryer sheets to clean them and they will shine like brand new again. Just wipe them with dryer sheets and watch water and soap spots disappear like magic. This trick also helps repel future water stains and grime. Want to easily get rid of all that nasty build up of dirt and grime in your window tracks? All you need is baking soda, white vinegar, and a toothbrush to make your window tracks shine again. You’ll be amazed by how clean your window tracks will be! The Intentional Mom has a step-by-step tutorial as well. Need shiny clean windows? Check out these window cleaning hacks to make them shiny clean. Is funny smell coming from your trash can? Just pour some vinegar on a slice of bread and let it soak up. Put that in the bottom of your smelly trash can and let it sit overnight. When you remove it the next day, the awful smell will be gone. It also works great for any smell in any container. Vinegar is a great deodorizer and these Vinegar uses are really handy!!! If you like these cleaning tips, then share the post!